Park City Utah has always been well known for its great ski homes, but in recent years the area has grown to offer some of the most amazing golf real estate as well. 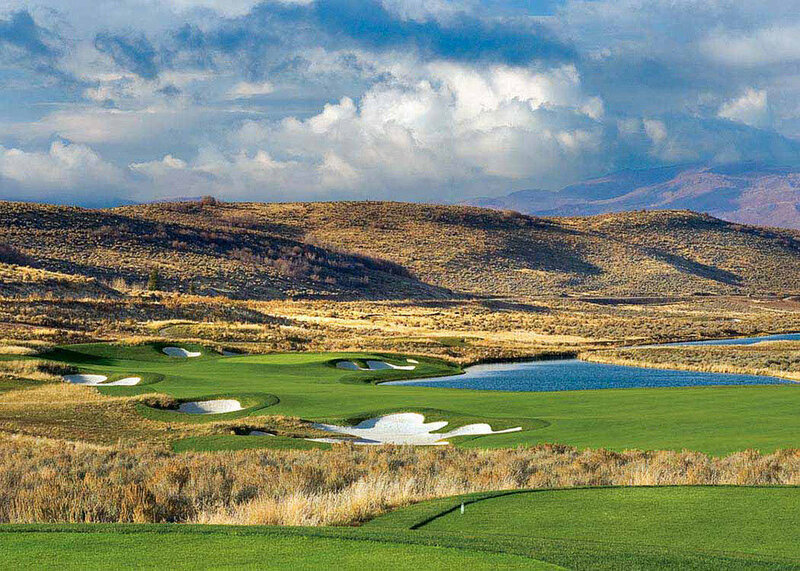 Park City is now home to both public and private golf courses that offer great real estate opportunities. Our private, gated golf resort communities include Promontory, Glenwild, Tuhaye, Red Ledges, and Victory Ranch. These private golf club communities offer many great four season amenities for the entire family to enjoy. You will find some of the most stunning mountain luxury homes in these neighbrhoods, or you can choose a homesite and design your ultimate dream home. Park City also has many public golf courses that run through residential neighborhoods. Park Meadows, Thaynes Canyon, and Jeremy Ranch all enjoy the benefits of beautifully manicured golf courses as an extension of thier neighborhood. For many years skiing was the main focus in Park City, but it has been interesting to watch these golf communities grow and prosper in our mountain town community. With both world-class skiing, and now world-class golf, there simply is no better place to call home. Read more about Park City luxury golf homes. Browse Park City golf homes for sale below or contact Heather Peterson & Sean Matyja for more information about Park City real estate. Looking for a Particular Style of Park City Golf Home? Park City and the neighboring areas have a great selection of golf homes to choose from. Depending on how close to the slopes you want to be, there is a golf community for every type of Utah home buyer. Below you will find a summary list of both private golf community homes and public communities that border to beautiful golf courses. The private communities all have various club memberships, depending on whether you wish to be a full golf member or a social member. The rules and pricing change often, so if you would like more information on any of these club properties, let us know and we can get the most updated info to you. We're always happy to be of help! Click here to view a Membership Amenities & Costs Report of Promontory and the other private golf communities. Park City’s premier gated and private community, stretches out over almost 900 acres and features a private Tom Fazio golf course named “BEST COURSE IN UTAH” by Golf Digest with a stunning 37,000-square-foot Clubhouse & Spa. With only 195 total homesites, Glenwild is one of the most limited private communities in the Western United States. Come discover a place where amenities combine with nature to form the harmonious balance you seek. Ranging in size from a half acre to more than seven acres, these generous homesites begin in the $400,000′s, which often includes the Club membership. View all real estate for sale in Glenwild. To live near three legendary ski mountains is a luxury. And to wake up to the most glorious summer weather with a championship Pete Dye Golf Course, as well as an upcoming Jack Nicklaus Signature Golf Course, is pure inspiration. Whether you buy or build, you can express your own personal style within flexible architectural guidelines that enhance and protect the value of your home. The intention is to protect views and ensure that the built environment at Promontory blends with the natural one, rather than obscuring it. These guidelines allow for a variety of individual tastes so that you have the freedom to express your own individuality. View all real estate for sale in Promontory. Aptly named “The Good Land,” Tuhaye captures the experience of the open ranch land —albeit from 6,000 to 7,200 feet. Saddled between the majestic Wasatch and Uinta Mountains, Tuhaye unveils striking views of the Timpanogos, the serene waters of Jordanelle Reservoir and up to the groomed Deer Valley® ski runs. This is a land of big skies and marked privacy, a Mark O’Meara-designed Signature course and the camaraderie of the Tuhaye Park Clubhouse. Within the 10,000-acre embrace of the all-inclusive Talisker Club, Tuhaye is creating a rich and fulfilling way of life that offers each generation adventure, new experiences and transcendent beauty — season after season, year after year. View all real estate listings for Tuhaye. Victory Ranch is a master-planned, private, gated community, located 17 miles east of Park City/Deer Valley Resort, Utah. th community will be made up of 6,700 acres of total land with over 4,000 acres of untouched backcountry, private access to 4 miles of the Upper Provo River and a champion designed 18-hole golf course. The real estate offering has just been dramatically changed to be a total density of 300 residences comprised of fewer than 200 custom homesites ranging from one acre to large backcountry ranches, as well as 100 ranch cabins/cottages. This is down from the previous plan of about 700 homes! The 18-hole Rees Jones-designed championship golf course has been designed to include outstanding practice facilities and memorable terrain guaranteed to shed a new perspective on the heart of the game. Masterfully ensconced in the rolling hills and dramatic outcroppings of the Ranch, with soaring eagles, free-roaming deer and wandering moose and elk, it may be hard to keep an eye on the ball. View all homes and lots for sale in Victory Ranch. The Red Ledges community is a private, gated golf and resident community with both lots and homes for sale. In the summertime, enjoy a round of golf on the Jack Nicklaus golf course and relax in the world-class Golf Clubhouse designed by Zmistowski. The Village Center is where you’ll find the Cliff Drysdale Tennis Academy with both indoor and outdoor courts and will also feature a spa, fitness center trading post, post office, kids’ camp and a Bistro. For a real western ride, head over to the equestrian center where you can board your horse or take riding lessons. View all real estate for sale in Red Ledges. These communities below are not private golf course communities, but are normal residential neighborhoods that benefit from bordering to a golf course. These communities are popular choices and can be great neighborhoods to live in. With the many homes that are adjacent to, or have views of the golf course, they benefit from the beautiful landscaping and the open space feel a golf course provides, yet these communities do not have the added fees the private communities have. Home to many permanent residents, the Park Meadows community flows from the flank of Quarry Mountain, around the Park Meadows Golf Course and abuts the undulating meadows of Round Valley. This established community retains a rare neighborhood camaraderie and a local vibe. While architectural styles and subdivisions vary greatly within the Park Meadows neighborhood, all residents can boast easy access to elementary, middle and high schools, the city-owned Park City Racquet Club and the Eccles Center for the Performing Arts. Much of Park Meadows enjoys huge views of the ski slopes, and the fairways of the Jack Nicklaus-designed golf course provide scenic vistas and open space. The gateway to Old Town, the Thaynes Canyon neighborhood curls around the Park City Municipal Golf Course, nestled against the base of Park City Mountain Resort. Tall trees, easy downtown access, and panoramic views of the slopes and the namesake Thaynes Canyon make this neighborhood a favorite of longtime locals. This mature This established community offers many architectural styles sizes, all residents can enjoy the convenience of in-town location being only blocks from Park City Mountain Resort®, Park City Municiple Golf Course, shopping, dining and professional services. Direct on and off-road trail access and many close by schools make for a great recreational hub for active families. Jeremy Ranch is a year-round community of primary residences and convenient access to both Salt Lake and Park City. Located on the north side on Interstate-80, Jeremy Ranch homes enjoy south-facing exposures with lots of sun, and the verdant open space of the Arnold Palmer-designed, 18-hole Jeremy Ranch Golf Club. Jeremy Ranch is home to the newest of the Park City’s area’s four elementary schools and is close to both shopping and dining at Quarry Village Commercial area as well as Kimball Junction’s variety of shopping, dining and professional services. Nestled among the slopes of Deer Valley® Resort and Empire Pass you will find Nakoma – an exclusive community of 18 individual mountain homes on 17 acres, offering spectacular, unobstructed views and ski-in/ski-out access. Nakoma gives it’s residents the rare opportunity to own a mountain home at Deer Valley® Resort with private access to the slopes, along with views looking out over thousands of acres of permenently protected forest and mountain terrain. The philosophy was simple. Create a community inspired by the legendary, four-season lifestyle of the Wasatch Mountains – one that offers its residents exclusive access to nature’s playground right out their front doors. The Links at the Homestead. A collection of 57 five to six bedroom timelessly crafted homes situated on The Homestead’s championship golf course in the heart of the charming Midway, Utah. Homes include main floor master suites. Homeowner amenities include a private entertainment pavilion and pool.